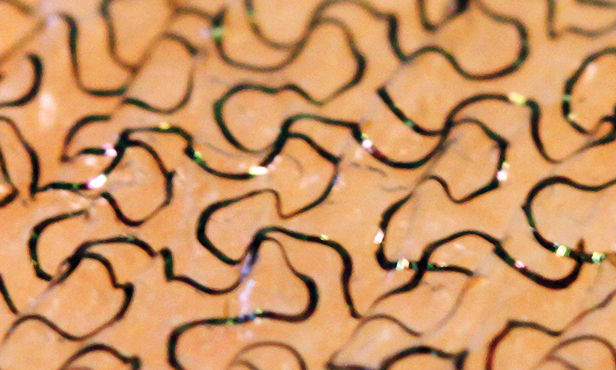 Curving, tiny wires in Lu's patch form a soft and pliable mesh. See Nanshu Lu present her work at our EmTech conference. Better integrating electronics with human tissue holds out the promise of monitoring the body more conveniently and accurately than is possible with sensors that are worn or taped on. Nanshu Lu is developing long-lasting “electronic tattoos” that can bond to skin and track and report on the wearer’s vital signs or translate small muscle movements into commands for controlling devices. Future versions may play critical roles inside the body in watching for signs of disease or damage. They could even treat problems automatically. Lu, an assistant professor in the department of aerospace engineering and engineering mechanics at the University of Texas at Austin, has solved a big problem in building electronics for biological tissue: silicon semiconductor circuits are flat, rigid, and brittle, making them a terrible match for the soft, pliable tissue. (See “Making Stretchable Electronics”) What is needed is a soft device better able to make intimate contact with skin. To create a more tissue-friendly chip, Lu enlisted a flexible polymer substrate on which she could deposit small islands of silicon. That technique had been tried by other researchers, but these devices had limited flexibility, since ordinary wires used to connect the silicon tear as the substrate stretches or twists with the tissue’s movement. Lu solved the wiring problem by eliminating the islands and replacing them with a serpentine mesh of nanoribbons; this webbing stands up to twisting and pulling without breaking. The resulting device is a 30-micrometer-thick patch of supersoft, transparent silicone. Lu has built a prototype of the device that carries sensors to measure temperature, strain, and electrical signals. The patch could also be equipped with LEDs to enable visual signaling. The circuits are printed onto silicone that’s supported by a stiffer layer of water-soluble polymer. When the patch is placed on dry skin and then wetted, the polymer layer dissolves; intermolecular attractions between the silicone and skin make the silicone adhere tightly. In tests, the silicone patches have adhered to skin for a week, hanging on even through showers and exercise. And the patches don’t irritate skin the way adhesives often do. Now Lu wants to see the patches used in a wide variety of health-related applications. She hopes to stick the devices on foreheads to directly monitor electrical activity in the brain, to place them on skin during plastic surgery so that strain gauges on the patch can alert surgeons if the procedure is overly stretching skin, to monitor heart rate and muscle activity during exercise, and to track the progress of healing in wounds and burns. Lu is working on new versions of the devices. For example, she’s trying to create stronger physical and electrical connections by integrating arrays of microneedles on the bottom of the silicone patches. That, in turn, could enable the patches to stick to heart muscle so doctors could detect early signs of heart-attack risk, such as reduced blood flow. Lu also hopes that a version of the patch with two-way communication capabilities might be able to sense heart arrhythmias and instantly respond by delivering small electric shocks to restore an even beat. And she envisions transdermal electronics that could detect the level of a protein in the body associated with a specific disorder and then release drugs to treat it.